Digger has been meticulously maintaining Ladies Only and Lower Ladies, with new step-downs installed to smooth out eroded sections, as well as plenty of regular maintenance work. 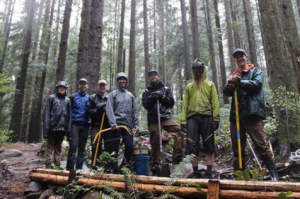 Lower Expresso was recently completed by Mark Wood and Rick Boles – with more than a little help from our friends, the Race Face Shore Corps, our TAP Sponsor Sacre-Davey, and support from local bike shops, businesses and community groups. Thanks to everyone who was part of the team effort getting Lower Expresso up and running! The trail will officially open once DNV provides approval and signage. Stay tuned for the announcement as well as a Grand Opening celebration happening soon! The trail crew have plans to start significant work on Expresso, as well as some major bridge replacements on Crinkum Crankum and Ladies Only. Keep an eye out for fresh wood slats and loads of more trail enjoyment. 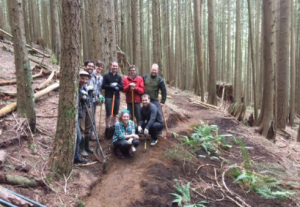 The NSMBA Trail Adoption Plan (TAP) program really got rolling this month. We facilitated 10 TAP days over the last 4 weeks! Thanks to all our sponsors and builders who have put in so much time and effort: Steed Cycles + Santa Cruz on the Fromme Ascent /// Arc’teryx on Dreamweaver /// TELUS on Bobsled /// Knight Piésold on the Fromme Ascent /// Sacré-Davey on Lower Expresso /// Comor Sports on Upper Griffen /// Central City Brewing on Boogieman /// Rocky Mountain Bicycles on Forever After. You are all amazing! Check out our Calendar of Events to stay up to date on upcoming events & trail days along with ways to get invovled!